So I thought originally to ring a bell as the thing I wanted to accomplish for my Rube Goldberg, but then I thought wait could I do something more practical. This was a challenge because there was not a wide variety of things to choose from what I was thinking of so I came up with the idea of getting a ball into a bin. My bins are going to be rectangular baskets and best of all I can use most of the same steps that I was going to use for my first idea and it also has the same amount of steps which is good because the minimum is 8 steps but I have more, that is good so I don’t have to think of a whole different plan. The process required a lot of research, I spent a couple hours after school one day. So basically I had to make some changes to the original and some challenges occurred and the process was hard. Research took a long time because well I had to find the information I wanted. That took a while because I had to find the videos/websites that had the good information and there were a lot of places that I could look. You learned what steps that I knew were possibilities and steps that I didn’t think that I would use. Oh man we had a lot of decisions being made during our Rube Goldberg project so far. For example I had to decide what my goal was going to be I chose to ring a bell. Then I had to decide my steps which was hard because I needed at least 8 steps but I got through now we have to decide what order they would be in but I got past. I got the idea from just thinking and thinking and research. I choose a lot of steps that did not work and in fact I decided to change my goal to getting a ball into a goal. I choose the steps I choose because I wanted the machine to be complex so I got a higher grade. The process for making my podcast was really hard and we had to first decide what topic we were going to talk about. Then we had to write our script and rehearse a lot so we could get it right when we recorded. After that we recorded and that’s when our practice cane in handy. it was hard to get a sound box and a microphone because there were 20 of us and only 4 microphones so we had to record and the give the tech to other people. last but not least we had to edit and fix our recording. There some challenges during this period of time one was getting a good recording, another one is that we had to add music, and finding the right music that we liked and also getting our script long enough we had to make sure our script was at least 2 mins long. In conclusion there were multiple steps that we had to finish and challenges along the way but we’re excited to make more podcasts! We just completed our moon unit. We saw the whole cycle of the moon. Uranus has 27 MOONS!! !, and Saturn has 62 MOONS!!! We are now expert on the moon kinda. The moon unit was really fun!!! 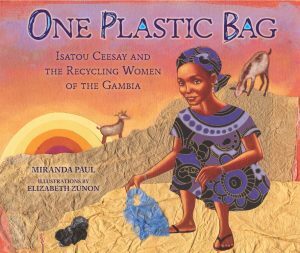 In class I read “One Plastic Bag.” The Story mainly about a woman who reuses plastic bags.My favorite part was when Isatou and the women make purses out of the plastic bags. Message of this book is polluting is not the way to go. I think you should too make the purses out of plastic bags because the plastic bags on the ground looked ugly and goats were dying. The book made me think about why plastic bags are bad for the Earth. This book was mainly about two girls end a group of kids who made Bali plastic bag free. my favorite part was when they said that Bali was already ⅔ of the way to Plastic bag free. This Ted talk reminded me of one plastic bag. The message of the Ted talk is that problems can always be solved. This Ted talk made me think what problem can I solve. The Ted talk inspired me to try to solve a problem. I chose to make a music book. I put a lot knowledge in this book. I hope you got the tune of this book.